All your life you dreamed of taking a vacation and suddenly it is almost time! Now, the pressure to get the most out of it. We all have different ideas about vacations. And, this will be a special one. You have to realize your own special needs and wants and incorporate all this into a well structured, fulfilling time. Consider Jamaica. It has a variety of beaches to choose from. Just know what you want and where to find it. Jamaica is the answer. Jamaica has the beaches that feature the traditional joys of pristine white sand and blue, blue waters, but also the rough, craggy type of beaches. The latter are great if you don't really like crowds. Some people go to Jamaica for the crowds because they like the active social scene. A great example is Doctor's Cave Beach, in Montego Bay. This one is known as a classic Caribbean vacation beach. It is about five miles long and covered with a fine white sandy beach that borders clear, cool waters. It is likely to be crowded. Very popular. Another example is Cornwall Beach. Known for lovely, white sand. It is part of Montego Bay. An example of the rough Jamaican beaches is Negril, where some of the most wild, untouched areas by the sea can be found. Look for craggy cliffs, amazing beauty, and lots of solitude – a favorite of naturalists from around the world. Another rough beach is Crane Beach, by Black River, notable for the naturalness of its environment. 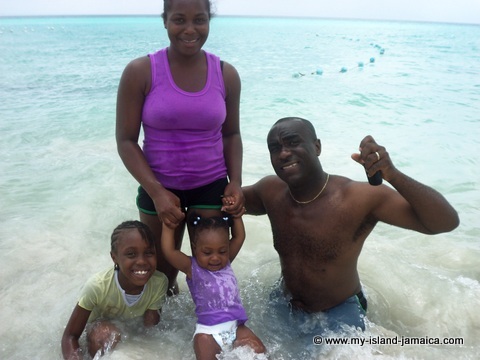 If you have a family, especially with young children, there are several beaches in Jamaica. These are known for their gentle waters that lack the strong currents and undertows found in other areas, making swimming safer for children. Some of the best are the Aqua Sol Beach in Montego Bay, San San Beach in Port Antonio, Blue Lagoon Beach, which is also in Port Antonio, and Dunn’s River Beach, located in Ocho Rios, fairly close to the famous waterfalls. For the surfer in the family, consider Boston Beach, where surfing equipment is easy to rent. And, the beaches of Long Bay offer the most consistent waves in Jamaica. For adventure, try Treasure Beach. But, while adventurous to the surfer, the undercurrent can be strong. And, those in search of beaches that combine the joys of sun, sand and surf with an active social scene or party scene will certainly enjoy Frenchman’s Cove in Port Antonio. Seven Mile Beach in Negril is considered a favorite place. There are more, but these among the best beaches in Jamaica! So, Jamaica is quite possibly your answer. Jamaica is a lovely island with about 200 miles of beaches. There are beaches to suit most every taste, from peaceful and natural surroundings to the pristine white sands and full services of the resorts, from beaches perfect for active water sports beaches to those known for their active social scene. Just a little planning will help you to choose the best beach for you. Study all the alternatives and make your choice wisely. And, wherever you decide to go...have a great vacation. Return to Jamaican Beaches Main Page. Alton Hargrave offers advice and resources for those interested in travel. His website, http://travel-venture.info contains information you need to plan your vacation wisely. Make sure you also subscribe to my free monthly e-zine My Island Jamaica Digest (MIJD) and get the latest from Jamaica!